I haven’t posted a link to a song in a long time but here we go. It’s Leonard Cohen’s Suzanne, a favourite of mine with an interesting connection to the statue I drew this morning. 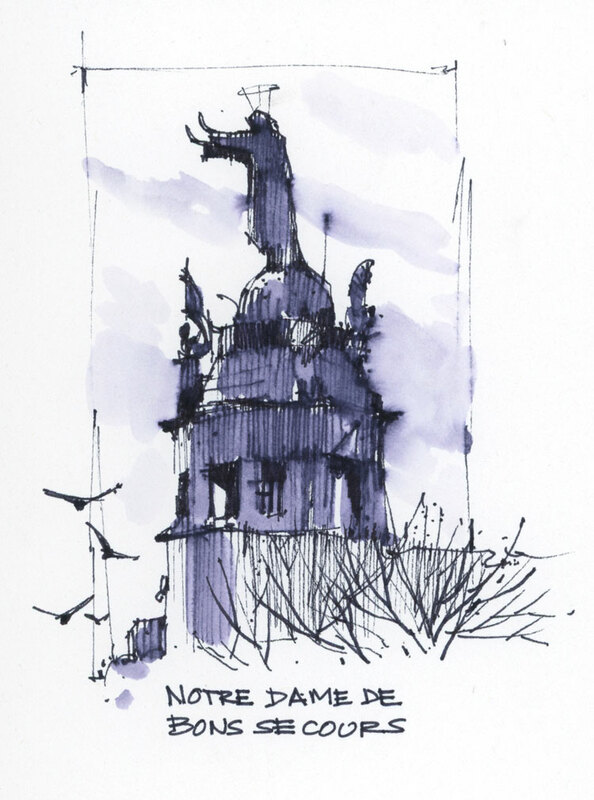 I’ve sketched Notre-Dame-de-Bons-Secours Chapel (the Sailor’s Church) from both inside and outside, but never realized until I did a little research today that “our lady of the harbour” from the song lyrics refers to the Star of the Sea statue atop the church. She’s been greeting sailors entering the port since 1893. Pretty cool fact for a Leonard Cohen fan to find out. Sketched in a Bee sketchbook, with a water-soluble Pilot Fineliner. Nice sketch, and it did bring back memories. I’m a Cohen fan too! So enjoy your blog and learning from you. Thanks so much Judith. My response to Hallelujah would definitely make the ink run on the page because it always brings tears to my eyes. Those pens are available at office supply stores. I buy mine at Bureau en Gros in Montreal, or even at the book store in my school. That was an interesting demo. I love the colours you can get when you activate the pen. Another one to try! Having lived in Winnipeg for decades but born and raised in Montreal (N.D.G. ), I enjoy seeing your Montreal sketches. THe Old Sailors’ Church is one of my favourites. Great to learn its link to Suzanne by L. Cohen. I bought a “brush pen” in my University Bookstore. They had many types of drawing pens, for both Architecture and Fine Arts. I really appreciate your blog.Thanks! Hi Jean. It’s always nice to hear from former Montrealers. That church is beautiful, both inside and out and is one of my favourites to draw too. I hope you get back to Montreal occasionally. Have you tried the brush pen yet? I hope you enjoy working with it. Love the song and now I have a lovely image to connect to it. Thanks Vicky. Yes, great song! Thanks for the information. His version on his Live in London CD is on my permanent playlist, along with all the other songs on the album. The combination of Leonard Cohen, the Webb Sisters and Sharon Robinson make it especially good to create a zen moment to sketch by. It’s better to watch the concert on UTube. When I come to Montreal I will make a point of sketching the Lady. Hi Ross, I will have to find that and give it a listen but in the meantime I will look for the Youtube version. Thanks for the recommendation. I did see him live in concert, many years ago, at Place des Arts. Amazing, of course! And if you come to Montreal to sketch, you should come on one of the Sundays when the Montreal Urban Sketchers go out. It’s a great and growing group. We always have a fun time. Ahhhhh so that’s what she looks like! This brought back some nostalgic flashbacks ( are ALL flashbacks nostalgic?) of an era that could have been . . . unrequited dreams of a gypsy soul. Never did make to Montreal in the 60’s to fall in love with Leonard Cohen (but I’m sure he didn’t miss me! LOL!). But must’ve passed that longing on to my granddaughter who is now living out her dreams of filmaking in Montreal. Sorry – got carried away and forgot this is an art blog. Oh the power of imagery. Thank you Shari. Thanks for making me laugh Gayle. How lovely, I’ve never heard that song before! You know what I’m loving about all these books you’re experimenting with and filling up? That because they’re far from perfect paper, you’re doing little sketches , all playing with different materials and effects. I love the runny line on this one. Hi Suhita. I have this strange compulsion to take bad paper and make it work for me. I don’t know why that is. I have plenty of good paper in the studio but it’s my personal challenge. Have you ever tried the Bee paper? Horrible for watercolour but fine for little sketches like this one. Yes, tried Bee paper, a long time ago. 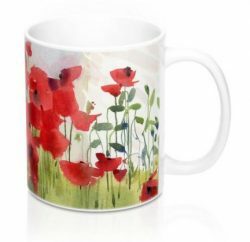 with watercolor, it absorbs all the color till it’s dull and flat. I have old bee books with sketches and I swear they get duller over time… scan your stuff. But about no-good paper: it’s really good at keeping me sketching and doing little stuff instead of filling pages edge to edge. Loving your recent ‘little vignettes’. What a beautiful drawing and a nice reference to Laughing Len! Love that song! It’s amazing what you can do with a little ink. I too will think of the song now..
I’m glad you found the pens Monique. Hope you like them. I love the song but I did not know about this. And tha drawing is wonderful, as always. Thanks. It’s great to hear from you Pedro. Hope you are well! I always enjoy your sketches. They are like a breath of fresh air. Just a comment on “Nôtre-Dame…”. Please take note that the accent on the “o”is incorrect. Thanks so much. It is fixed! Thanks for remembering this one Ellen.